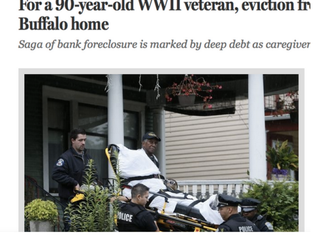 Johnnie Hodges, 90, was evicted from his Buffalo, N.Y., home, and when he refused to leave, police and ambulance workers carried him away on a stretcher July 9, 2015. The story of Johnnie H. Hodges, a 90-year-old Navy veteran of World War II, and the home that he lived in for some 60 years is chock-full of sadness and missed chances. Hodges lived in his Buffalo, N.Y., home with his wife for decades. About four years ago, Hodges spent most of his income caring for his wife, who had Alzheimer’s disease. In the process, he defaulted on his mortgage and amassed debt totaling $73,000 to M&T Bank. Last week Hodges was evicted, literally taken from his home on a stretcher, after a two-hour standoff with U.S. marshals. The bank told the Buffalo News that it tried everything to prevent this from happening, but Hodges didn’t accept any of its offers. “It’s a sad day for everyone involved because this outcome could have been avoided,” C. Michael Zabel, vice president of corporate communications at M&T, said in a statement viewed by the newspaper. According to the Buffalo News, around October 2011, Hodges was sent a notice stating that he had defaulted on his home loan, according to court documents. A meeting was set up between the bank and Hodges in May 2012 to figure out a way to keep Hodges in his home. Hodges reportedly didn’t show up to the meeting. Court records viewed by the newspaper show that Hodges was sent notice of an upcoming sale in December 2013 but didn’t respond or appeal. The house was sold in foreclosure in January 2014. Since the sale, the bank reportedly delayed Hodges’ eviction three times, but Hodges told the newspaper June 24—a day he was supposed to be evicted—that he had faith. “There’s a man upstairs saying everything is going to be all right,” he told the Buffalo News, and the eviction was postponed. A potential buyer, a disabled veteran who sympathized with Hodges’ situation, offered to buy the home from the bank and allow Hodges to stay for $1 a year, but the newspaper reports that when the buyer discussed renting out an upstairs apartment in the 3,200-square-foot home to help recoup money on his investment, the deal fell apart. There were fundraisers and several donations from people who wanted to help, but when Hodges realized that the home wasn’t going to be in his name, he didn’t have any interest in negotiating with the bank any longer. When M&T foreclosed on the property, it became the owners. So, on July 9, the 90-year-old man who had lived in his house for some 60 years walked onto the porch and told everyone in listening distance, “They’re going to have to take me—I’m not leaving.” He told police to take him out in handcuffs, but they refused, and after two hours of negotiating, an ambulance crew and police officers lifted him from his porch chair and placed him on a stretcher and rolled him away from his home. The Buffalo News notes that Hodges was transported to a “mental health evaluation by VA Western New York Health Care System.” There was no report on where he will be headed once or even if he leaves. The newspaper did note that shortly after removing Hodges from the front porch, movers walked into the home with boxes to pack up 60 years of memories. The bank has paid for two large storage units for the first two months, and after that, the debt falls to his family. Hodges’ daughter believes that more could have been done for her father, who spent 60 years in the only home she has known.